Myanmar State Counselor Daw Aung San Suu Kyi left Myanmar for Japan on Friday. It is her third visit to the Land of the Rising Sun since 2013. Prior to that she had not visited the country since her sojourn at Kyoto University as a researcher in 1985-86. This year marks the 64th anniversary of diplomatic relations between Myanmar and Japan. But the two countries’ modern relations can be traced back further, to the arrival of Japanese military officer Colonel Keiji Suzuki in Rangoon in 1940. The colonel met with Daw Aung San Suu Kyi’s father, Myanmar independence hero General Aung San, who with 29 other youths would receive military training by the Japanese on Hainan Island in 1941 with the aim of overthrowing British rule in Burma. Fast-forward more than seven decades; Japan is one of the countries that has assisted Myanmar most consistently in nearly every sector from development to health to education since it achieved independence in 1948, and the countries continue to maintain warm relations. Here is The Irrawaddy’s timeline of the key events that have shaped bilateral relations for the past 78 years. May: Colonel Keiji Suzuki arrives in Rangoon on a mission that will ultimately lay the groundwork for the Japanese occupation of Burma. November: Aung San meets Col. Suzuki in Tokyo to request Japanese support for Burmese independence. 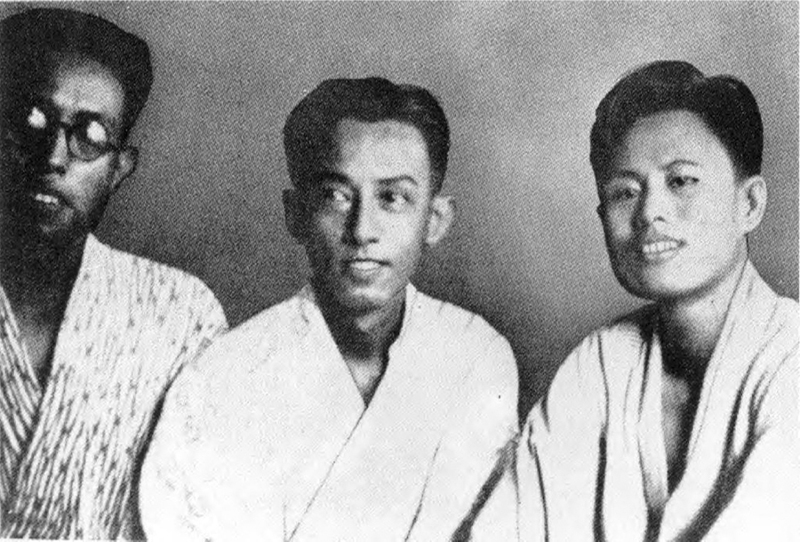 February: Aung San returns to Burma to recruit the Thirty Comrades, with an offer of arms and financial support from the Fumimaro Konoe government of Japan. He returns briefly to Japan to receive more military training, accompanied by the first batch of young revolutionaries, who come to be known as the Thirty Comrades. 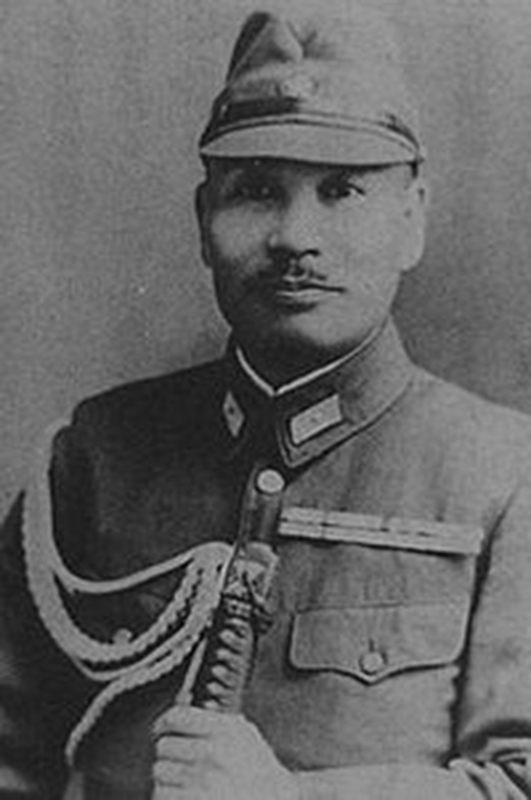 Mid-year: Minami Kikan begins training the Thirty Comrades on Hainan Island. Dec. 8: The Burma Independence Army (BIA) is formally established in Bangkok, headed by General Aung San. January: Japanese forces capture Kawthaung, Tavoy, Mergui and Moulmein, assisted by the BIA. Rangoon falls in March. Mandalay and Lashio are captured and the Burma Road is cut. The British end the Burma Campaign. June: Japan establishes the provisional Burmese government with Dr. Ba Maw as chancellor. The BIA is dissolved and replaced by the Burma Defense Army (BDA), headed by General Aung San. Aug. 1: Japanese Premier Hideki Tojo declares Burma’s “independence” within the greater East Asia Co-Prosperity Sphere. August: General Aung San establishes the Anti-Fascist Organization. It is later transformed into a united front, including communists and socialists, and renamed the Anti-Fascist People’s Freedom League (AFPFL). March 27: General Aung San leads the Burma National Army in an uprising against the Japanese, accompanied by the British. The day is recognized as Revolutionary Day, and later as Armed Forces Day. Aug. 15: Japan surrenders. The British-run Civil Affairs Service (Burma) rules the country. July 19: Gen. Aung San, six of his cabinet ministers, a cabinet secretary and a bodyguard are assassinated by his political rival U Saw. Jan. 4: The Union of Burma achieves independence from British colonial rule. 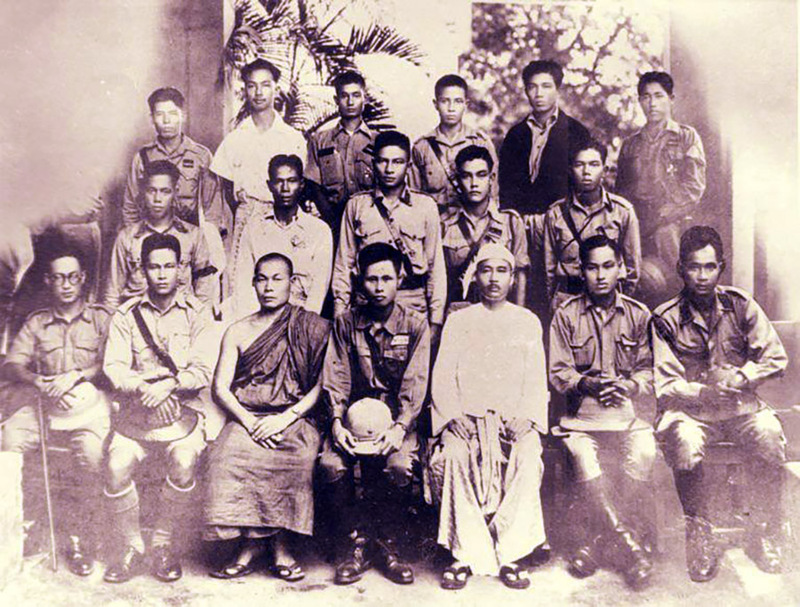 U Nu becomes the first prime minister of Burma under the provisions of the 1947 Constitution of the Union of Burma. Nov. 4: Two years after the end of the Allied occupation of Japan, the Union of Burma and Japan sign a peace treaty and reach agreement on war reparations of USD250 million. Nov. 5: Diplomatic relations between Burma and Japan are established after the signing of the peace treaty between the two countries. March: The first phase of the Baluchaung hydropower project in Kayah State is completed; the project is funded through the Japanese government’s Official Development Assistance (ODA) program. March 2: General Ne Win overthrows the U Nu government in a coup d’etat. The Revolutionary Council is established and presides over the launch of a state socialist economy. March 30: Japan and Burma sign the Agreement on Economic and Technical Cooperation and Protocol, addressing Burma’s claim to additional reparations. The agreement comes into force after the two sides resolve a conflict over the payment of pure reparations. Japan pays additional war reparations to Burma totaling USD140 million. Chairman of the Revolutionary Council Gen. Ne Win visits Japan, meeting with Emperor Hirohito and Prime Minister Eisaku Sato. The meeting focuses on Japan’s future support for the agricultural sector in Burma. Gen. Ne Win and Sato declare the 1963 agreement a success and hail its contribution to Burma’s development. Sept. 20-22: Prime Minister Sato visits Myanmar at the invitation of Gen. Ne Win. April: Gen. Ne Win makes his second visit to Prime Minister Sato in Tokyo. They agreed to promote trade and technical cooperation. November: Gen. Ne Win makes his third visit to Japan. He requests bilateral assistance, as well as Tokyo’s support in securing assistance from international financial institutions including the World Bank, the Asia Development Bank (ADB) and major donors. After policy changes in the early 1970s, Burma-Japan relations are quite active with frequent exchanges of visits by officials, business leaders and technical experts on development projects. Burma joins the ADB, in which Japan is the largest shareholder. Gen. Ne Win’s government awards Burma’s highest military honor to seven Japanese for their sacrifices and work on behalf of the country. Daw Aung San Suu Kyi works as a researcher at the Center for Southeast Asian Studies at Kyoto University. April: Burmese Deputy Prime Minister U Tin Tun meets the Japanese prime minister and finance minister in Tokyo. March-early September: The 8888 pro-democracy protests erupt in Rangoon and other cities. Also known as the 8-8-88 Uprising, the protests aim to oust the dictatorship of Gen. Ne Win and climax on Aug. 8 1988. Sept. 18: The Burmese military stages a coup d’etat. General Saw Maung becomes the leader of the country and a new government, the State Law and Order Restoration Council (SLORC), is announced. Sept. 28: Japanese Ambassador Hiroshi Ohtaka states that resumption of ODA flows will depend on political stabilization. Jan. 4: Along with other diplomats, Ambassador Ohtaka boycotts SLORC’s Independence Day celebrations. Feb. 25: Japan formally recognizes SLORC. Some committed ODA funds are released. July 20: The military places Daw Aung San Suu Kyi under house arrest. The sale of part of the grounds of the Burmese Embassy in Tokyo provides SLORC with about USD435 million in much-needed hard currency. May 27: General elections are held in Myanmar. They are the first multi-party elections since the military dictatorship began in 1960. Daw Aung San Suu Kyi’s National League for Democracy (NLD) wins the election in a landslide, but the military junta refuses to recognize the results. Aug. 30: Watanabe Michio, a leading member of Japan’s ruling Liberal Democratic Party, visits Yangon and urges Daw Aung San Suu Kyi’s release during a meeting with Myanmar authorities. November: Ogata Sadako, a Japanese diplomat serving as the UN’s independent expert on the human rights situation in Myanmar, visits Yangon to inspect the rights situation. An anti-Japanese campaign begins in the state-run media. Japan extends debt-relief grants to Myanmar totaling USD544 million. October: Daw Aung San Suu Kyi is awarded the Nobel Peace Prize. The Japanese government urges her release from house arrest. June: General Khin Nyunt, Secretary 1 of the SLORC, visits Japan. July 10: Daw Aung San Suu Kyi is released from house arrest. October: Japan announces a grant of 1.6 billion yen for the renovation of the Rangoon Nursing Institute. Direct flights between Rangoon and Kansai Airport near Osaka begin after All Nippon Airways petitions the Japanese government to open the route. Feb. 28: The Japanese government formally announces 2.5 billion yen in loans for the modernization of Rangoon airport, classified as humanitarian aid. “Letters from Burma”, a book of essays by Daw Aung San Suu Kyi, is published in 1997. The book is published in English and Japanese. The essays are published serially in the Monday morning editions of the Japanese newspapers Mainichi Shimbun and Mainichi Daily News from Nov. 27, 1995 to Dec. 9, 1996. April: The Japanese government formally announces 3.5 billion yen in ODA loans for the repair of the Baluchaung hydroelectric plant following the opening of dialogue between Daw Aung San Suu Kyi and the SLORC. Japanese Foreign Minister Yoriko Kawaguchi visits Myanmar. May 30: Foreign Minister Kawaguchi expresses disappointment over an incident in which Daw Aung San Suu Kyi and her supporters are attacked by state-sponsored thugs near Depayin. January: Japanese Senior Vice Minister for Foreign Affairs Tetsuro Yano visits Myanmar. December: Prime Minister Gen. Khin Nyunt visits Japan. December: Minister for Foreign Affairs U Win Aung visits Japan. June: Japan provides human resource development scholarships worth about USD4.86 million. July: Tokyo announces an ODA grant of USD3.15 billion to fund a reforestation project in central Myanmar. To date, Tokyo has provided nearly 30 small ODA grants to non-governmental organizations for various operations in Myanmar. 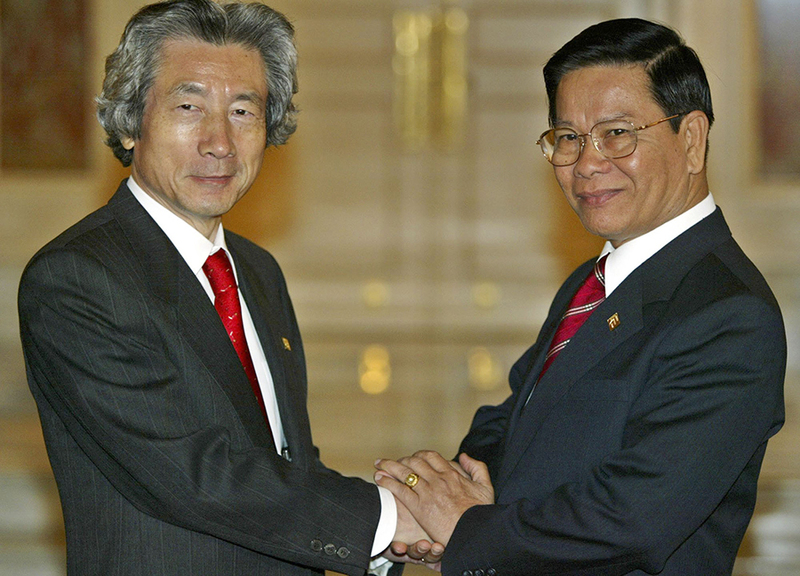 Nov. 5: Japanese Prime Minister Junichiro Koizumi holds a summit meeting with Myanmar Prime Minister Senior-General Than Shwe. Koizumi states his expectation that efforts toward democratization would continue, while noting the role of Daw Aung San Suu Kyi. Nov. 23-24: The Workshop on Japan-Myanmar Cooperation for Structural Adjustment of the Myanmar Economy is held in Yangon. It is cosponsored by the government of Japan and the government of Myanmar. May: Minister for Foreign Affairs U Nyan Win visits Japan. Japanese photojournalist Kenji Nagai is shot dead in downtown Yangon as soldiers open fire on Saffron Revolution demonstrators. January: Minister for Foreign Affairs U Nyan Win visits Japan. May: Japanese Senior Vice Minister for Foreign Affairs Hitoshi Kimura visits Myanmar. 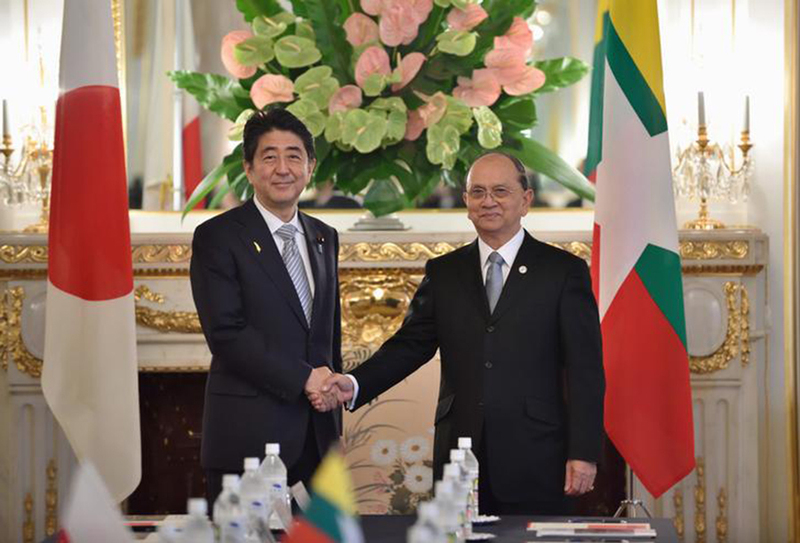 November: Prime Minister U Thein Sein visits Japan. January: The Japanese-backed Thilawa Special Economic Zone is announced. Located south of Yangon, the project has an estimated cost of USD3.28 billion. June: Parliamentary Vice Minister for Foreign Affairs Makiko Kikuta visits Myanmar (Yangon and Naypyitaw) and exchanges views with both government officials and leaders of the pro-democracy movement including Daw Aung San Suu Kyi. October: Minister for Foreign Affairs U Wunna Maung Lwin visits Japan. Nov. 18: Japanese Prime Minister Yoshihiko Noda holds a meeting with President Thein Sein in Bali, Indonesia, on the sidelines of an ASEAN summit. The bilateral meeting marked the first summit talks between the two countries since the transfer of power to a civilian government in Myanmar. Dec. 25: Japanese Foreign Minister Koichiro Gemba visits Myanmar. It is the first visit by a Japanese foreign minister in nine years. Dec. 26: Gemba holds a morning meeting with President Thein Sein in Naypyitaw to discuss Myanmar’s democratization and national reconciliation process. That evening, he meets with Daw Aung San Suu Kyi to discuss future free and fair elections, conditions attached to the NLD’s political activities, and the release of more political prisoners. January: Japanese Economy, Trade and Industry Minister Yukio Edano meets with NLD chair Daw Aung San Suu Kyi at her home in Yangon. March: At the invitation of the Myanmar government, Japan dispatches three electoral monitors from the Japanese Ministry of Foreign Affairs and the Japanese Embassy to observe the legislative by-election in Myanmar scheduled for Sunday, April 1. The Japanese government announces that it expects the by-election to be held freely and fairly. April: President Thein Sein visits Japan. Tokyo extends grant aid for two projects in Myanmar of up to 583 million yen and 251 million yen, respectively. May: Upper House Speaker U Khin Aung Myint visits Japan. July: Minister for Foreign Affairs U Wunna Maung Lwin visits Japan and meets with Foreign Minister Gemba. Nov. 19: Japanese Prime Minister Noda meets with President Thein Sein in Phnom Penh, Cambodia, during an ASEAN summit. Nov. 21: Japan supplies emergency relief goods (blankets, sleeping pads, plastic sheets and generators) worth 10 million yen (around USD125,000) to Myanmar through the Japan International Cooperation Agency (JICA) in response to an earthquake in Myanmar. February: A Japan-Myanmar Human Rights dialogue is held in Naypyitaw. April: NLD chairperson Daw Aung San Suu Kyi visits Japan for the first time in 27 years. May: Shinzo Abe makes the first official visit to Myanmar by a Japanese prime minister in 36 years. During the visit leaders agree to further promote people-to-people and cultural exchanges between the two countries. Japan pledges USD5.7 billion in loans. November: Lower House Speaker Thura U Shwe Mann visits Japan. December: President Thein Sein visits Japan to attend the ASEAN-Japan Commemorative Summit Meeting. Prime Minister Abe promises that both the public and private sectors in Japan will support Myanmar in its efforts at reform of various kinds. March: Japanese Foreign Minister Fumio Kishida visits Myanmar. May: The second Japan-Myanmar Human Rights Dialogue is held in Naypyitaw. The two countries exchange views on the human rights situation including the release of prisoners of conscience, freedom of opinion and expression, democratic transition and establishing the rule of law, the 2015 elections, the activities of the National Human Rights Commission and peace negotiations. August: Japanese Foreign Minister Kishida visits Myanmar to attend an ASEAN Foreign Ministers’ Meeting. 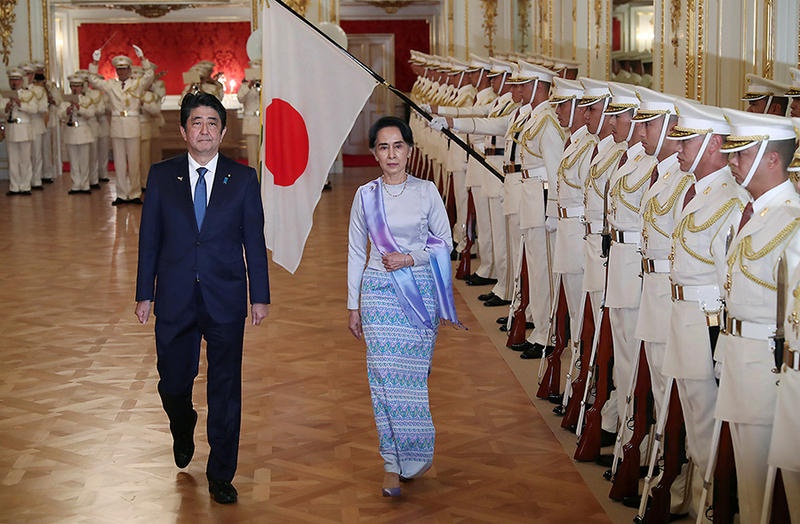 November: Japanese Prime Minister Abe visits Myanmar to attend an ASEAN summit. July: President U Thein Sein visits Japan. September: Deputy Prime Minister and Finance Minister Aso visits Myanmar. November: The NLD wins the general election in a landslide on Nov. 8. Two weeks later, U Nyan Win, party spokesman and Central Executive Committee member, visits Japan and meets with Foreign Minister Kishida. Japan seeks to exchange opinions with the NLD in order to support democratization and development in Myanmar and strengthen bilateral relations. January: Minister for Foreign Affairs U Wunna Maung Lwin visits Japan to attend a Foreign Ministers’ Meeting. May: Foreign Minister Kishida visits Myanmar to show support for the newly elected government, whose de facto leader is State Counselor Daw Aung San Suu Kyi. June: The ADB announces it will lend Myanmar about USD1.75 billion in low-interest loans from 2017 over five years to improve infrastructure, education and rural development. September: State Counselor Daw Aung San Suu Kyi meets with Japanese Prime Minister Abe in Laos during an ASEAN summit. 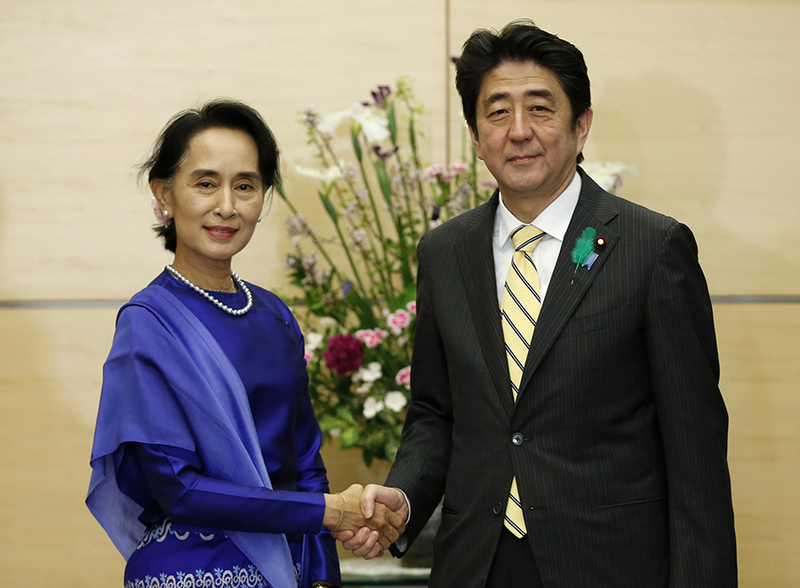 Nov. 1-5: State Counselor Daw Aung San Suu Kyi makes an official visit to Japan. Prime Minister Abe pledges a loan provision of up to 10.787 billion yen for the Hydropower Plants Rehabilitation Project. He also announces an 800-billion-yen (USD7.7 billion) aid, loans and investment package to promote development and reconciliation in Myanmar. September: Iwao Horii, Japan’s parliamentary vice minister for foreign affairs, visits Myanmar to exchange views regarding the situation in northern Rakhine State. Japan extends emergency grant aid of USD4 million through international agencies to assist those in Myanmar and Bangladesh affected by the Rohingya crisis. Nov. 14: Japanese Prime Minister Abe meets with State Counselor Daw Aung San Suu Kyi during a visit to the Philippines to attend an ASEAN summit. Nov. 20: Senior General Min Aung Hlaing, commander-in-chief of the Defense Services of Myanmar, meets with Kazuyuki Nakane, Japan’s state minister for foreign affairs, in Naypyitaw during the ASEM Foreign Ministers’ Meeting. Dec. 14: President Htin Kyaw meets with Japanese Prime Minister Abe during a visit to Japan. Jan. 12: Japanese Foreign Minister Taro Kono meets with State Counselor Daw Aung Suu Kyi in Naypyitaw. During his trip he also meets Myanmar military chief Sen-Gen. Min Aung Hlaing. Japan extends Emergency Grant Aid of 330 million yen (USD3 million) to Myanmar to assist displaced persons returning to Myanmar from Bangladesh, in accordance with a repatriation agreement signed on Nov. 23, 2017 by Myanmar and Bangladesh. Jan. 13: Japanese Foreign Minister Kono visits Maungdaw Township, Rakhine State. He is accompanied by Prof. Dr. Win Myat Aye, Union minister for social welfare, relief and resettlement, and Rakhine State Chief Minister U Nyi Pu. March 23: Japanese Parliamentary Vice Minister Iwao Horii holds a series of meetings in Naypyitaw with military chief Sen-Gen. Min Aung Hlaing; Kyaw Tint Swe, Union minister for the Office of the State Counselor; and Soe Aung, deputy Union minister for social welfare, relief and resettlement. The meetings emphasize the importance of steady implementation of the safe, voluntary and dignified return of displaced persons, the easing of tensions and the promotion of reconciliation between the communities in Rakhine State. 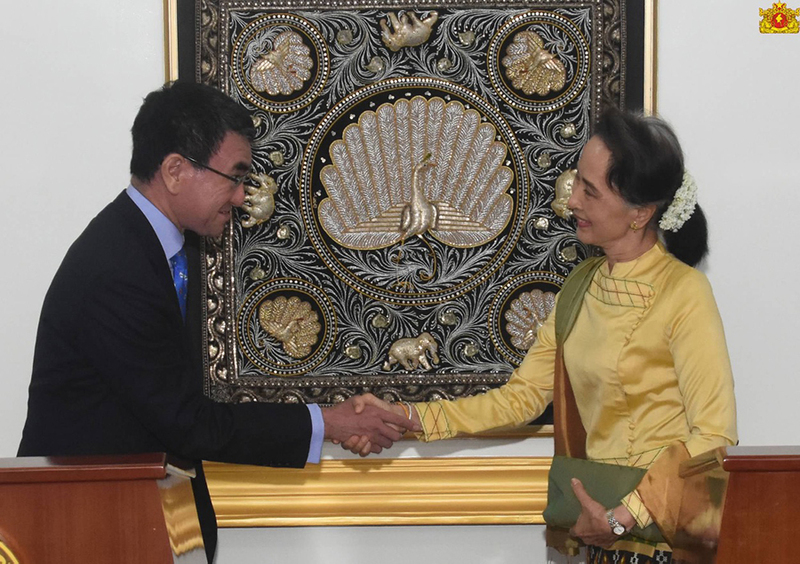 May 28: State Counselor Daw Aung San Suu Kyi talks by telephone with Japanese Foreign Minister Taro Kono to discuss the situation in Rakhine State. July 30: Myanmar establishes a commission of inquiry to probe allegations of human rights abuses in conflict-torn Rakhine State. The President’s Office names four people to serve on the commission, include two international experts: Philippine diplomat Rosario Manalo and former Japanese Ambassador to the UN Kenzo Oshima. 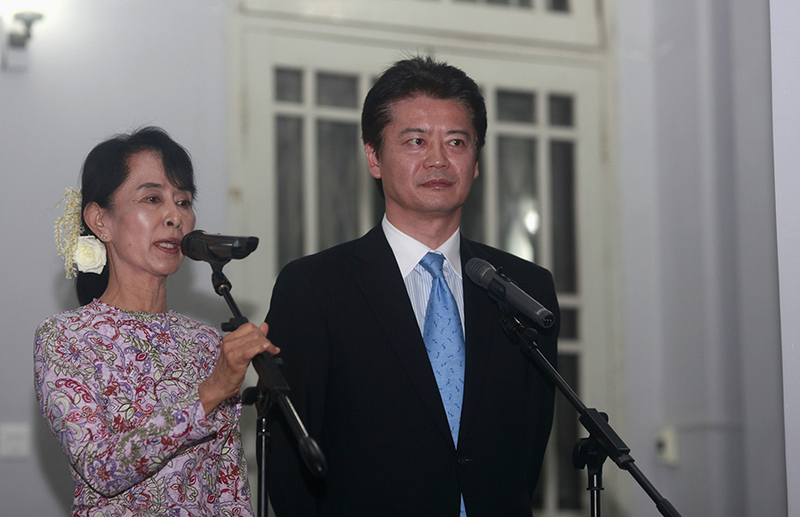 Aug. 6: Japanese Foreign Minister Kono visits Myanmar. He meets with President U Win Myint and holds a joint press conference with State Counselor Daw Aung San Suu Kyi. He also meets military chief Sen-Gen. Min Aung Hlaing, Union Minister for International Cooperation U Kyaw Tin and Union Minister for the Office of the State Counselor Kyaw Tint Swe in Naypyitaw. 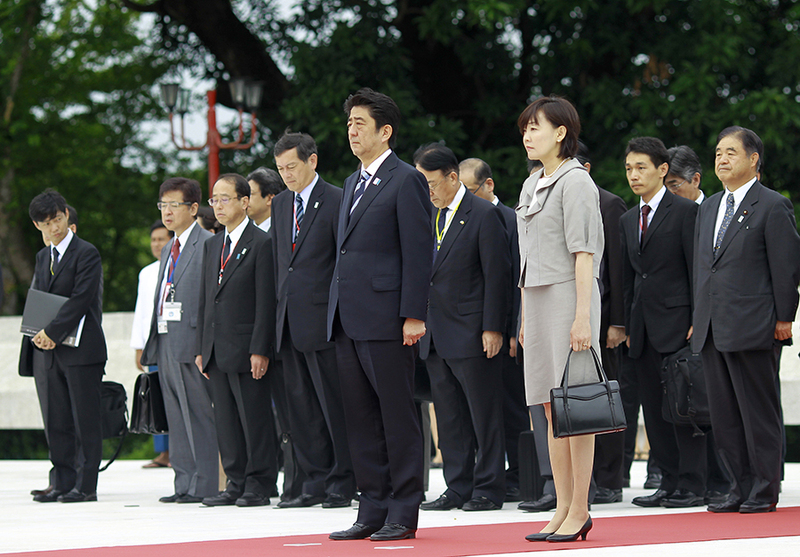 Oct. 5-9: State Counselor Daw Aung San Suu Kyi visits Japan to attend the 10th Mekong-Japan Summit. Sources: “Burma and Japan since 1940” by Donald Seekins; the Japanese Foreign Ministry’s Japan-Myanmar Relations archive; “Myanmar-Japan Relations (1962-74)” by Daw Khin Ma Ma Myo; and “Japan-Myanmar: A ‘Special’ Economic Relationship” by Chandrima Chaudhuri.